Study shows that vesicles appear to also contribute to Alzheimer’s disease. Alzheimer’s disease (AD) is characterized by cognitive decline, alteration of synaptic transmission, and neuronal death brought on by accumulation of neurofibrillary tangles in neurons and amyloid beta in the brain. The leading hypothesis for the cause of AD is an impairment of clearance of amyloid beta resulting from the β-cleavage of the amyloid precursor protein. Recent studies showing that reducing amyloid beta load in mouse models improves cognitive function strongly suggest reducing plaque burden is a potential treatment strategy for AD. Now, a study from researchers at Augusta University shows that vesicles, fluid-filled sacs that brain cells make to trap amyloid, appear to contribute to the disease. The team state that their findings suggest reducing the production of these vesicles could help reduce the amount of amyloid and lipid that accumulate, slow disease progression and help protect cognition. 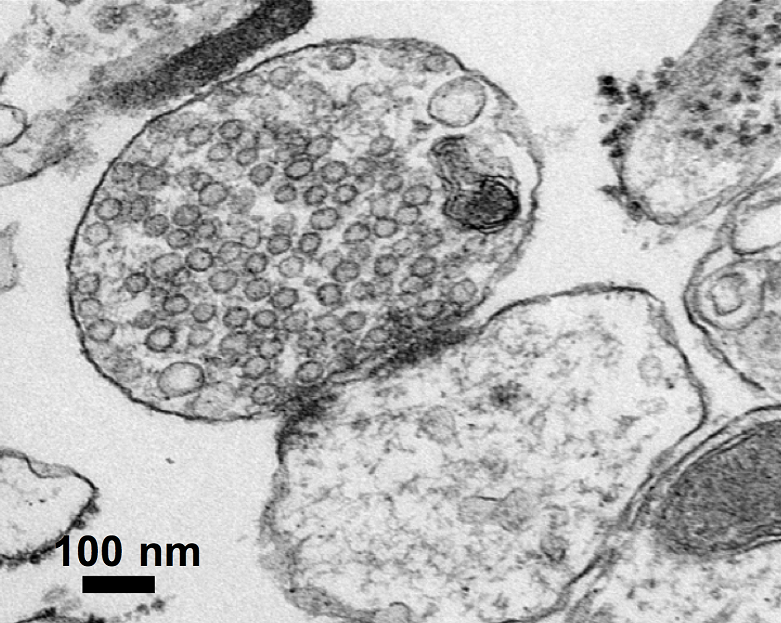 Vesicles, or exosomes, are ceramide-enriched and generated by inward-budding of the endosomal membrane; they are secreted when these multivesicular endosomes fuse with the plasma membrane. Vesicles carry signaling factors and miRNAs that mediate intercellular communication, and there is evidence that vesicles play a role in the progression of AD. Amyloid beta processing has been associated with endosomal compartments with amyloid beta and C-terminal fragments being secreted in association with vesicles. In neural cells, vesicle formation can be blocked by inhibition or silencing of the enzyme, neutral sphingomyelinase-2 (nSMase2). It is, however, unclear what role vesicles play in the aggregation and/or clearance of amyloid beta. The current study followed the process in an animal model with several genetic mutations found in types of Alzheimer’s that tend to run in families and make brain plaques early in life. The current study utilised one mouse group genetically programmed to make a nonfunctional form of nSMase2. The group explain that amyloid activates this enzyme, which in turn converts sphingomyelin into ceramide, which is known to be significantly elevated in Alzheimer’s. Results show that vesicles made by astrocytes accelerated the formation of beta amyloid and blocked its clearance in the animal model of Alzheimer’s. Data findings show that male mice, which were also sphingomyelinase-deficient, developed fewer plaques and exosomes, produced less ceramide and performed better in cognitive testing. The lab note that, for reasons which are unclear, female mice did not reap similar benefits, and stress that Alzheimer’s tends to be more aggressive in women. The team also observed ceramide and amyloid clustered together in the brains of mice without sphingomyelinase suppression. They explain that inside the brain, ceramide is an important component of the cell membrane, however, when too much starts collecting in the vesicles, it combines with amyloid to form a disruptive and eventually deadly aggregate. The researchers state that, to their knowledge, this is the first evidence that mice whose brain cells don’t make as many vesicles are protected from the excessive plaque accumulation that is the hallmark of Alzheimer’s. They go on to add it is also an indicator drugs that inhibit exosome secretion may be an effective Alzheimer’s therapy. The team surmise that their findings suggest sphingomyelinase is causative in making ceramide, vesicles and plaques. For the future, the researchers state they are testing different drugs given to patients for reasons other than Alzheimer’s that may also inhibit sphingomyelinase and ultimately ceramide and exosome production. The image shows an isolated synapse from a brain sample before mass spectrometry analyses. The pre-synapse typically shows many vesicles containing neurotransmitters kept attached to the post-synapse (Z. Taoufiq, OIST 2013).